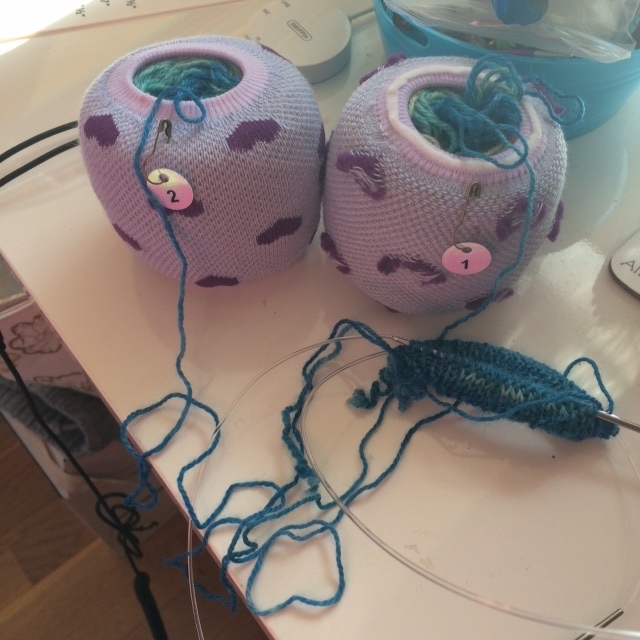 And this time I’m using the same yarn- this is actually gradient yarn from the Knitcircus gradient yarn club and as I’m doing the same colour yarn for both I put each ball into a yarn sleeve and not only turned one inside out but also marked them with numbers to be on the safe side! But I was just wondering if there were more patterns out there for this type of sock knitting and even though I did not find a new pattern I did find a great tutorial and I think I did not share that with you last time so here goes (or if I did, well maybe you didn’t see it last time or if you did you will just have to forgive me for my loss of memory). 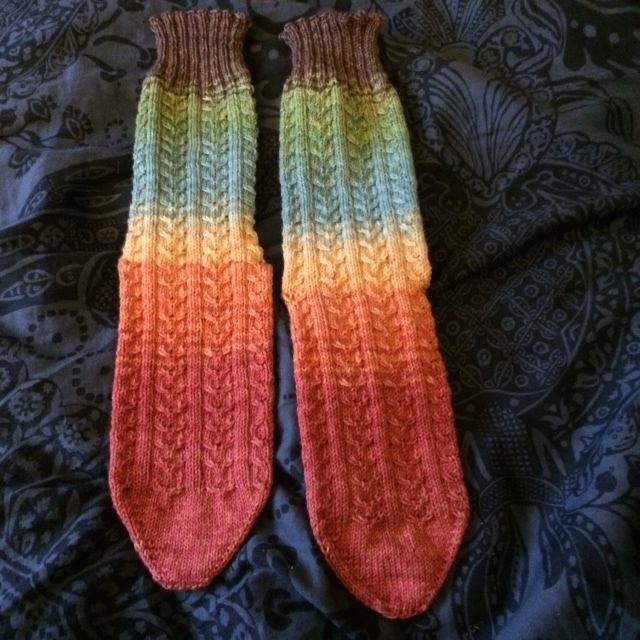 So do you feel like joining me and making a pair yourself? If not now, maybe we can organise a KAL later on? and I have also knit in support of breast cancer. 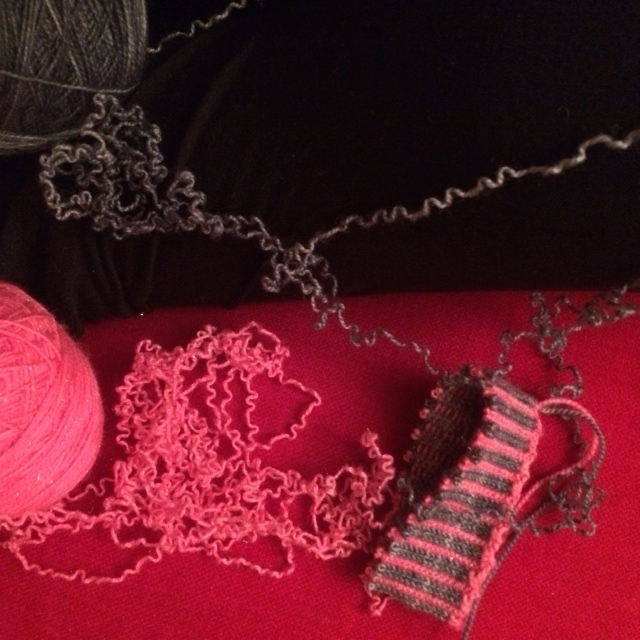 I feel that knitting for charity is not only knitting for a good cause but also a bit selfish because it brings such pleasure to know that what I’m knitting is going to be useful for someone in need. 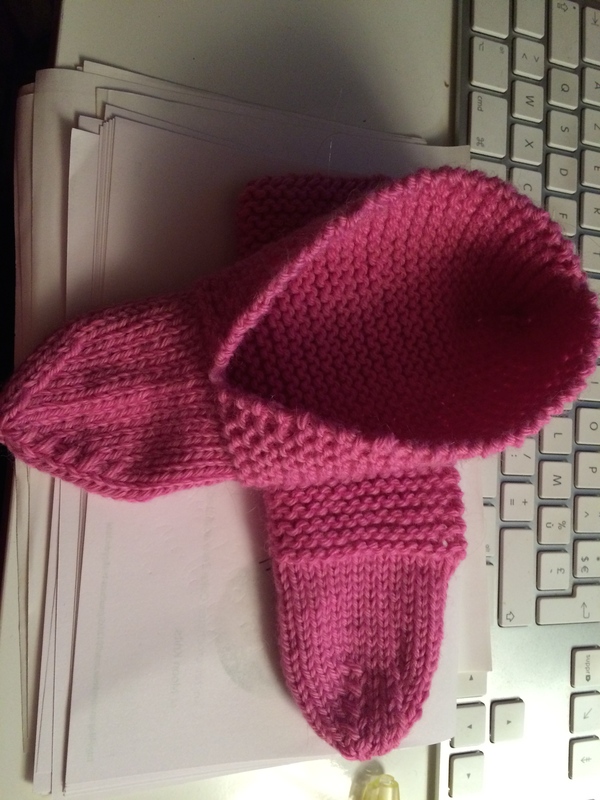 I prefer to knit items that are then donated rather than knit something that will be sold to raise funds because I have seen first hand that people are just not ready to pay a reasonable price for hand knit items. People do not realise the price of the yarn let alone the work that goes into making the item. 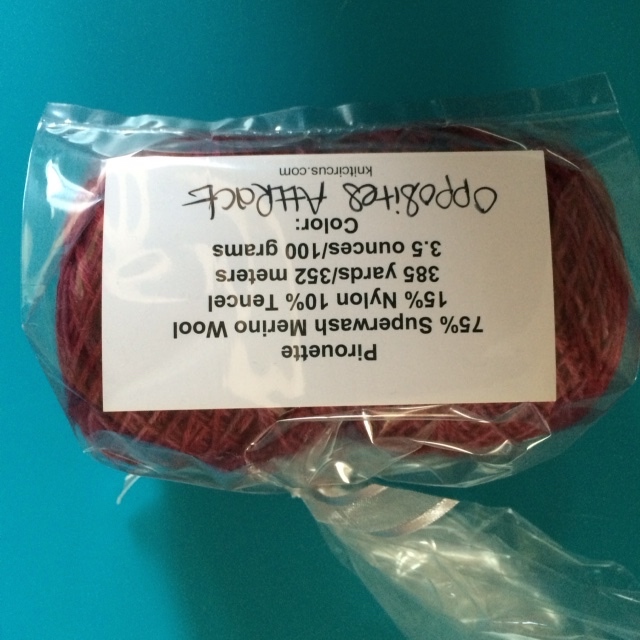 It is just so disheartening when you spend your hard earned money on good yarn and the little free time you have to knit something for a wonderful cause and then your items either just don’t sell or are being sold for a ridiculous price that does not even cover the price of the yarn alone. I recently got burned doing this late last year and I think and hope that it was the very last time for me! 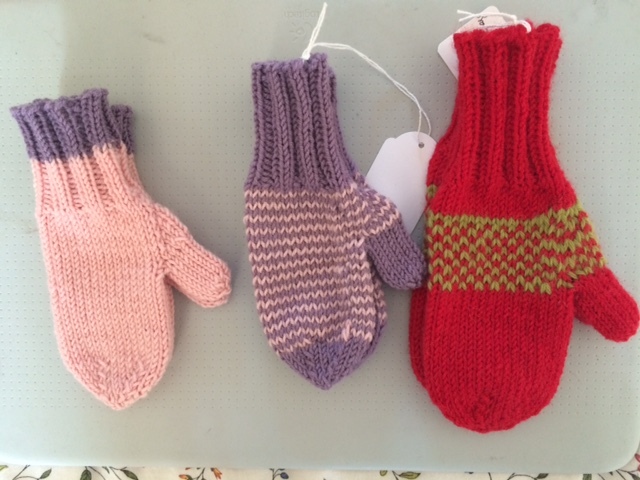 My mother and I knit a number of mittens and socks and small accessories that were to be sold at a christmas market in my town to raise funds for a local charity for children with cancer. As I also enjoy making fantasy jewelry I also made some bookmarks, hair accessories, rings and earrings for them to sell. These cost a lot less to make and take way less time to prepare and yet that is what actually sold and what people were willing to pay for! I was so disappointed about the lack of interest in my handknits that I had put all my heart into making that I vowed to NEVER knit another item to sell! I’ve not given up on knitting for charity though, I will just do it differently and knit items that will then be GIVEN directly to those who need them. The charity in my town that supports children with cancer and their families is organising another fundraiser and I will be making jewelry for them but NOT any knits. And speaking of charity knitting where your knitted item is gifted to the recipient who needs it, I just discovered a great charity as I was reading my spring issue of Addicted to Sock Knitting ezine It is called Knitted Knockers Charities Inc. – click here for the website This is a charity that focuses on knitting prosthetics for women who have suffered a mastectomy. 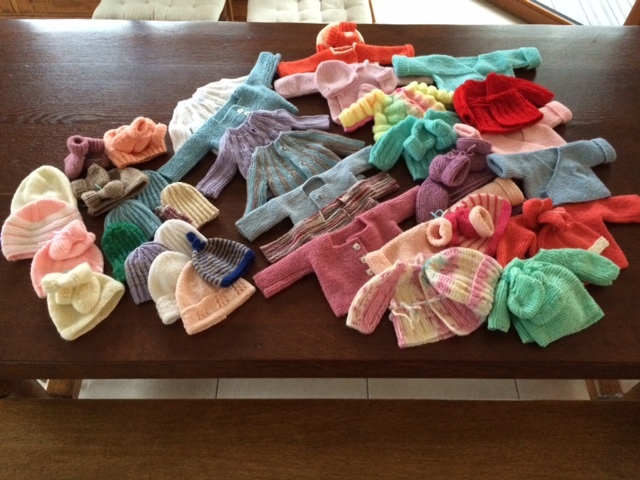 They work in the USA as well as in Europe and women in need can send them an email and request a knitted breast. 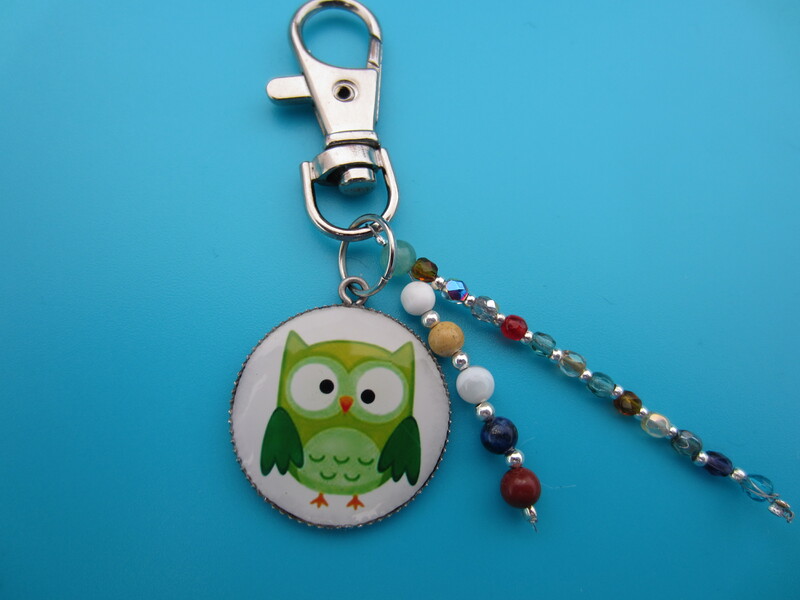 The website gives you a free pattern and information on the mission of this charity. They are currently requesting prosthetics in cup sizes B, D and DD. So if you feel like doing some charity knitting and help a woman who has suffered a mastectomy then this is definitely a charity I would recommend. Do you do charity knitting on a regular basis? Do you knit for all types of charities or just one and how do you choose which charity you would like to support? Do you know of a charity that is in need of donations? Please do share with us by leaving a comment after the post. I did it! I actually FROGGED the whole thing! Hm, yes unfortunately you did read correctly! 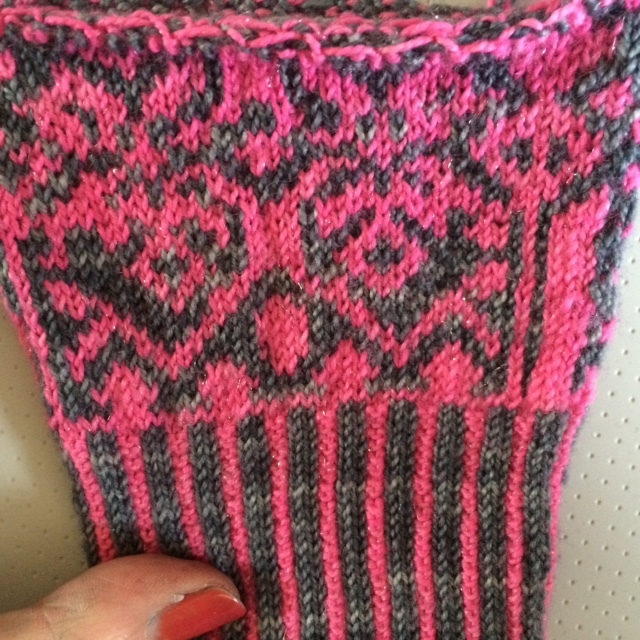 Despite my good intentions and your encouragements and advice, I still went ahead and frogged my mitten! Yikes, the needles are gone! And here it is, almost totally gone! So WHAT happened?? Well 2 things actually. 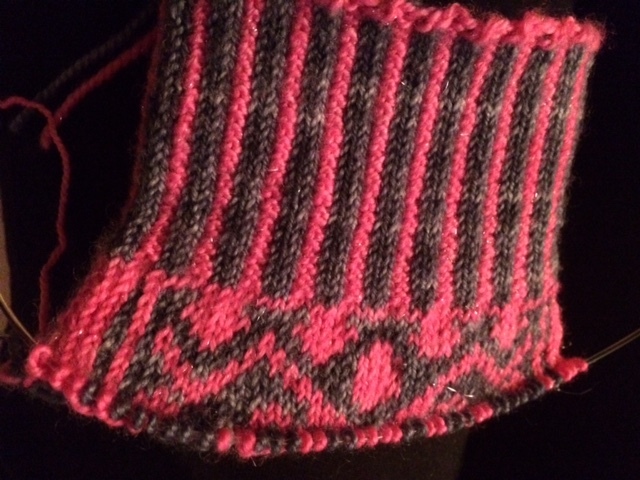 1) I’m stubborn and there just was something that bothered me about the mitten so far. I don’t know exactly what but it just did not feel quite like I wanted it to. And 2) I did actually take the mitten and knit a few more rounds last night and as I was about to call it a night, I tried it on and it felt too big. I’m tall and usually do all my knitting in L but this was too big and I was afraid that if I continued it would not only be too large but too long as well. So I just felt like it was ALL wrong so….I’m sorry for disappointing you but I think the mittens will be all the better for this. I’m convinced that my 2nd try will be THE good one! I’ll be going to Iceland to visit my mom and family in a few days and the trip from Normandy, France is very long so I’m planning all the knitting I need to take with me both for the actual trip and for the time I’m there. I’m going to do the mittens and hopefully I’ll be able to progress nicely and then I need something that demands less concentration so either socks or the entrelac scarf/stole I showed you the other day. Or maybe all 3! I’m just totally unable to JUST knit 1 thing at a time. 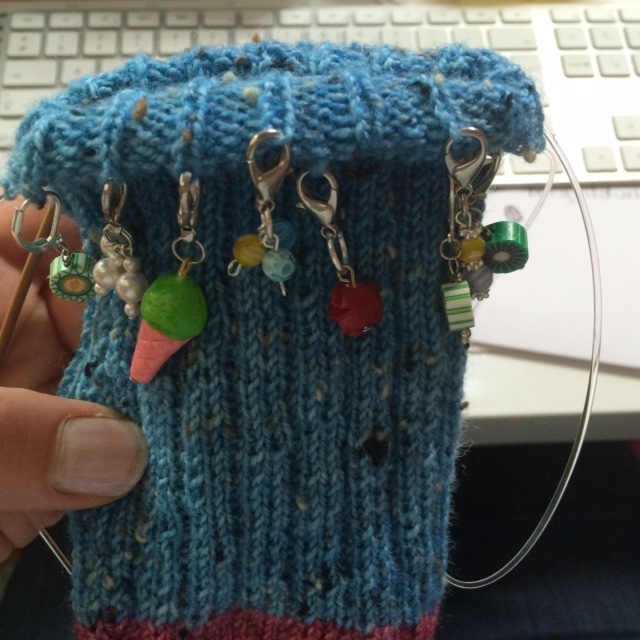 I need to have a variety of projects going at the same time and I knit each one in different circumstances. I have the easy peasy for work – when work is slow I can knit between phone calls, I have one medium knit for the tv/evening knits – something interesting without requiring total concentration and then one more intricate knit that I will do when I have the time to just be by myself and knit for a little while and concentrate totally on what I’m doing. Hi there, as you all know there are a number of magazines that are issued on the topic of knitting, crochet, spinning etc and maybe you even subscribe to some of those like I have. I used to subscribe to The Knitter, Simply Knitting, Interweave Knits, Designer Knits, Vogue Knitting to mention a few. The problem, for me, with regards to “physical” magazines is SPACE or lack there of to store my gazillion knitting magazines. So recently I have been diving more and more into digital subscriptions and just buying single issues of magazines that interest me. For me the plus is that they take no physical space and I have them with me at all times – that is as long as I have my ipad/phone/laptop with me. Today I’d like to talk about 2 publications that I recently encountered and that maybe you are unaware of but might enjoy discovering. First of there is Knitsy. Knitsy is a digital magazine and you can get the app on iTunes or Android market and then purchase editions or subscribe via the app. I discovered this publication when the editor contacted me and said they’d like to feature some of my handspun yarns in their issue. I was of course super happy and more than willing for them to show off my work. I immediately went online and set up the app and subscribed. What is different about this magazine, I feel, is that it is truly interactive. You will have videos and as you read or check out an ad you can actually click through to that particular vendor for example. 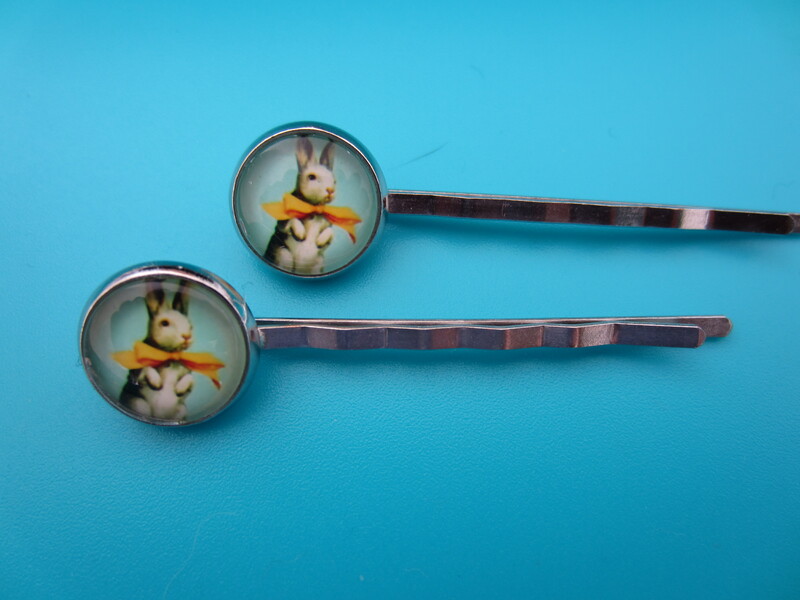 Each edition will have a large selection of patterns as well as technique features such as how to sew up your knits, how to do a particular stitch, how to convert needle sizes or yarn weights. You will also enjoy seeing and learning about new yarns and accessories and reading interviews with designers and other inspirational people in the industry. In the March issue of Knitsy there is a wonderful interview with Althea Crome on miniature knitting. Althea Crome is maybe best known for her work in the animated film Coraline (I think the name is the same in English as it is in French). Althea is an incredible artist and her miniature knits are amazing works of art. 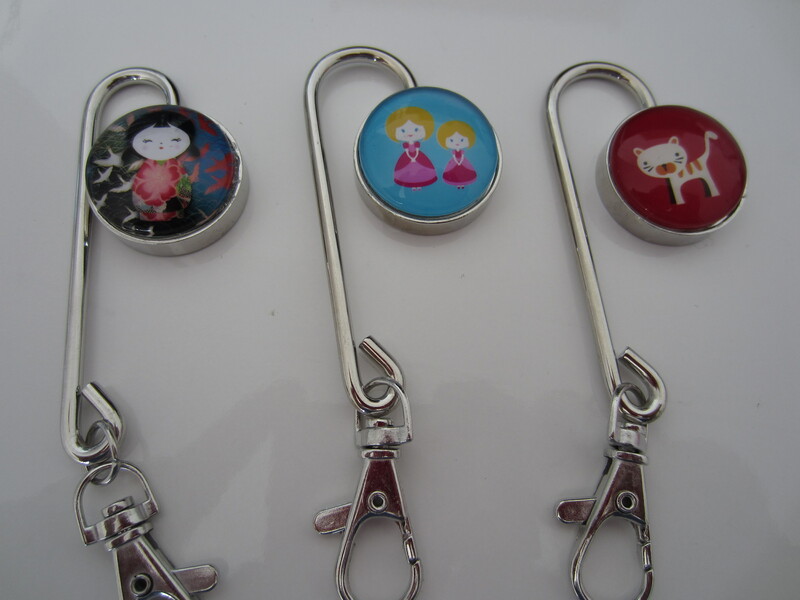 Knitsy is a very varied publication so you are sure to find something to your liking. The publication also has its own website with lots of info and links to download the app just click here for all the info. 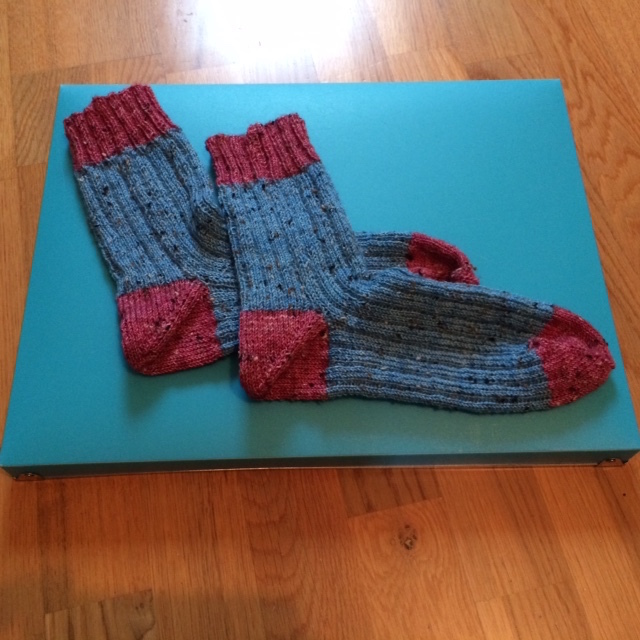 As the name indicates this is a group for sock knitting aficionados and boy there are many! This group actually has over 10,000 members and be warned, it is highly addictive! The group is run by Debra Garner and she also has a website with the same name www.addictedtosockknitting.com There you will find her blog, her podcast as well as her ezine. 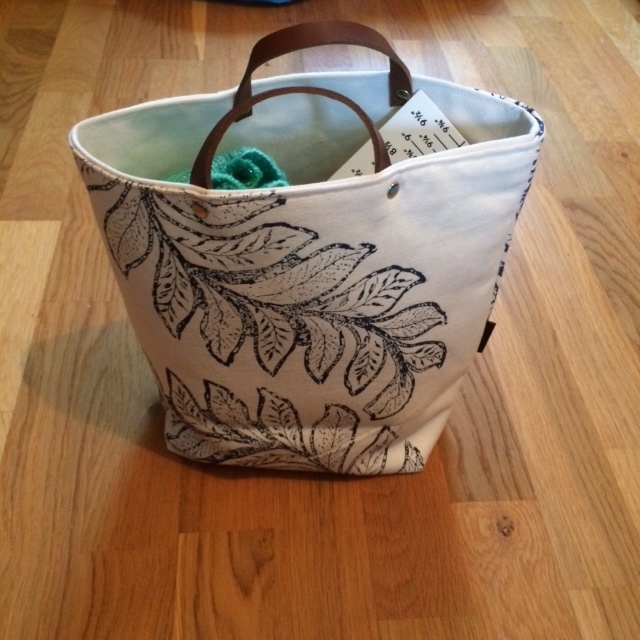 She also has a small shop selling patterns, project bags and knitting kits for example. The ezine is a digital/downloadable publication and Debra being the generous knitter she is, she has made this publication available for us European knitters by offering the ezine as a pdf download that she manually sends out. Her spring issue is just out and it is 160 pages of knitting pleasure. 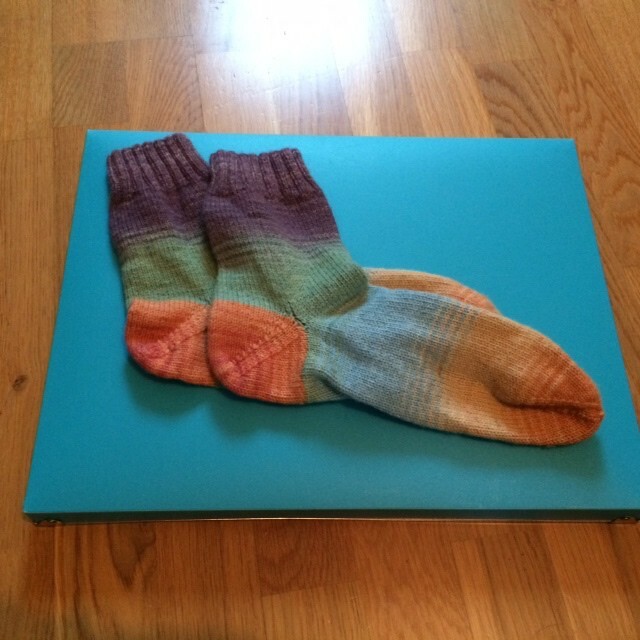 This huge ezine has a large number of sock patterns and some are even given both for top down and toe up knitting so you will definitely find a pattern or 10 to add to your to knit list. 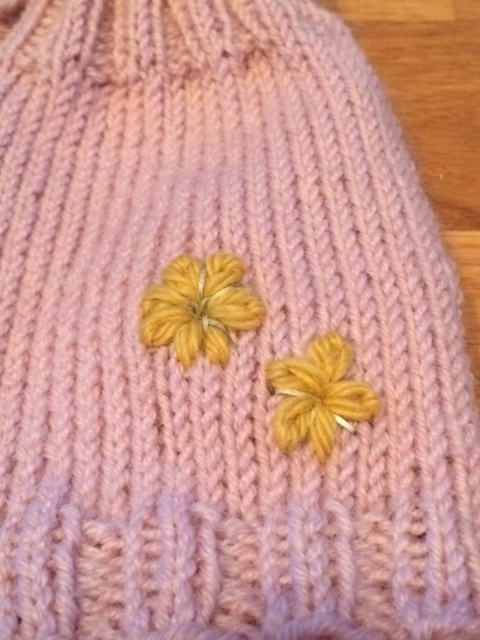 There are also knitting technique articles such as the “Gauge” article by Andi Smith of “Big Foot Knits”. You will also find interviews with designers and indie dyers and enjoy the galleries of pictures sent in by members of the group. 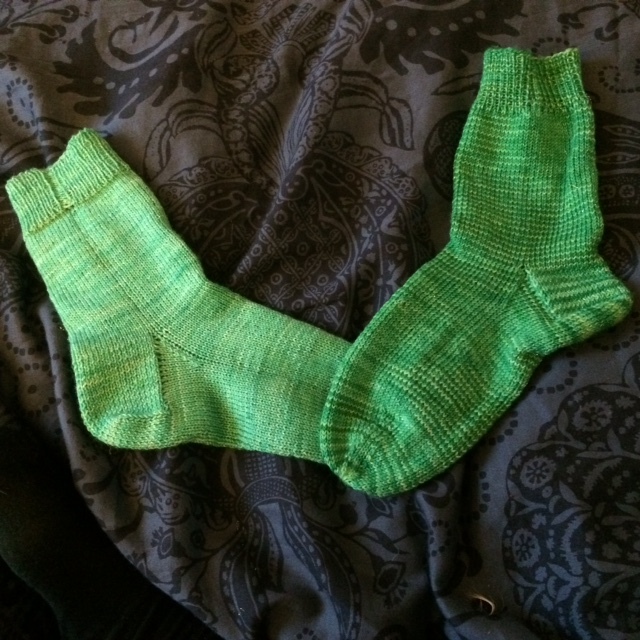 You will see hand knit socks and socks spun using handspun yarn (I even have a pair there). This is a participative publication written by knitters for knitters and you will read all 160 pages in one setting if you possibly can – I did in 2 settings and loved every page! 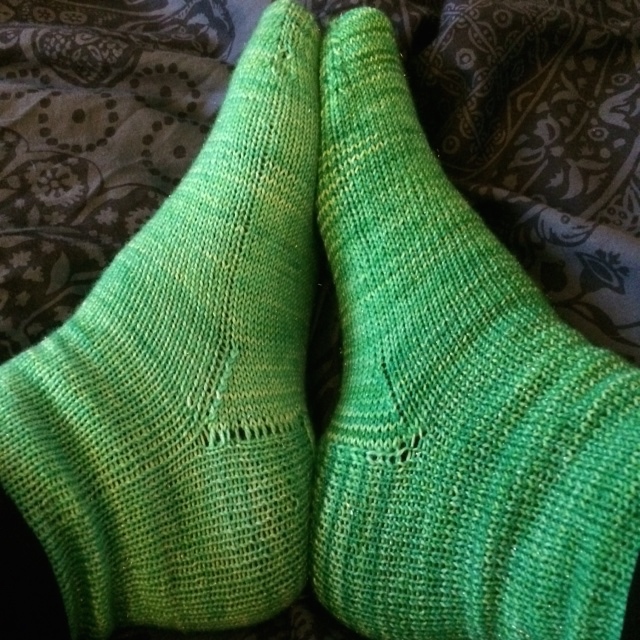 As a knitter I appreciate the number of sock knitting patterns that are all varied (colour work, lace, cables), as a spinner I enjoyed the article about spinning your sock yarn and the gallery of photos of handspun, handknit socks, as a dyer I enjoyed reading the interviews with dyers AlohaBlu and Stray Cat Socks. I highly recommend both publications as enjoyable and informative reads for all knitters. Also both publications are looking for submissions so if you have something you would like to share – a review of a LYS, a technique that you master and would like to teach us, a pattern you have designed, a review of some of the tools of the trade and so forth, you should definitely submit an article and who knows, you just might be published in their next edition! Hi, there just a quick post this evening. 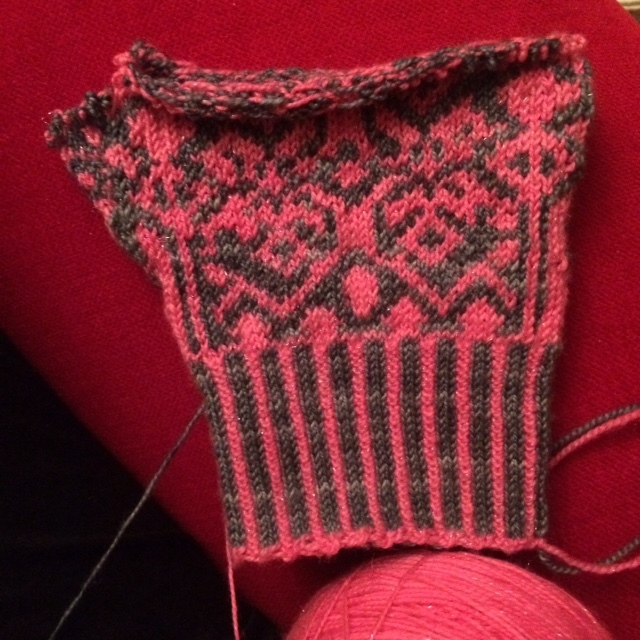 I did a lot of work on my fair isle mitt today and I think I just may have done something wrong. Either I missed something of the pattern or I need to change my colours – my current MC needs to be the CC. At the moment my MC is the petrol blue and the CC is the neon pink but I feel that the pattern on the front does not show well enough and that maybe if I turned this around and made the neon pink the MC and the petrol blue the CC things would look better. But before I actually go ahead and RIP out EVERYTHING I’ve knit over the last 48h, I need your help and support! What do you think? I hate frogging BUT I don’t want to finish an entire mitten IF I’ve done something wrong. I’m not that far along that I can’t bear to rip back so I think its now or never! This is the front and this is the back I feel that the pattern on the back looks ok, If I change the colours around the back would be mostly pink. As for the front I just don’t know. 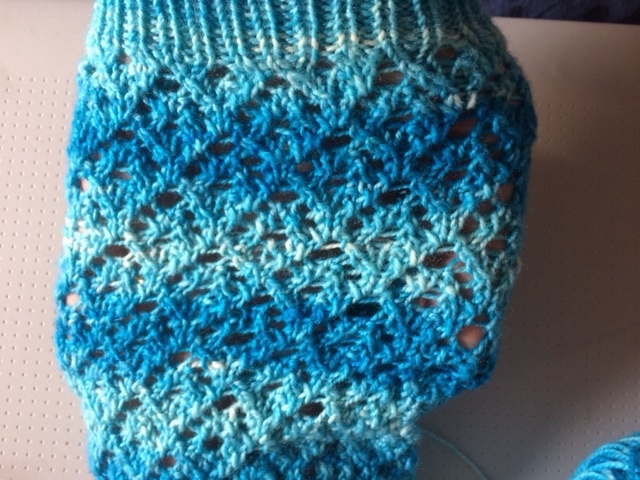 Do you think I need to knit a bit more into the pattern before taking a decision? Or do you see a clear error immediately? 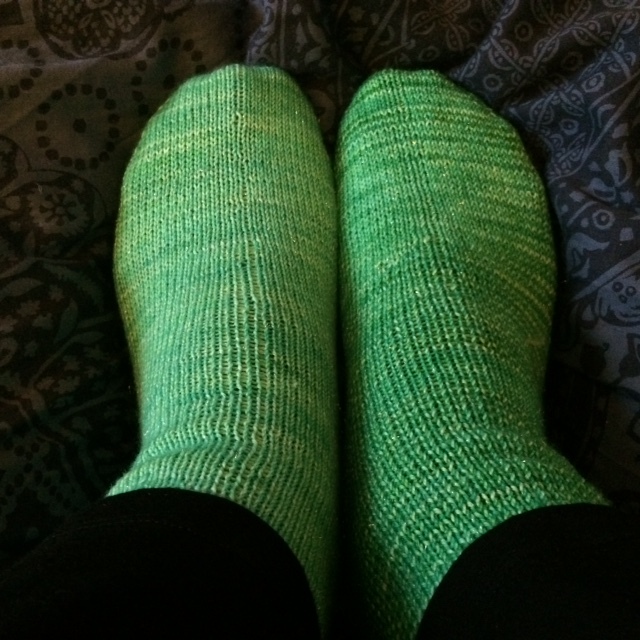 Hi there, I told you a while back that I’m part of a sock yarn club run by Jalaa Spiro of Knitcircus. It’s her gradient sock yarn club and I have knit 3 pairs of socks using her yarns so far. Isn’t that yarn just gorgeous? A warm red to soft red to soft yellow/green, to a sort of sea green to turquoise to blue. That’s how I see the colors now as I look at the yarn cake. 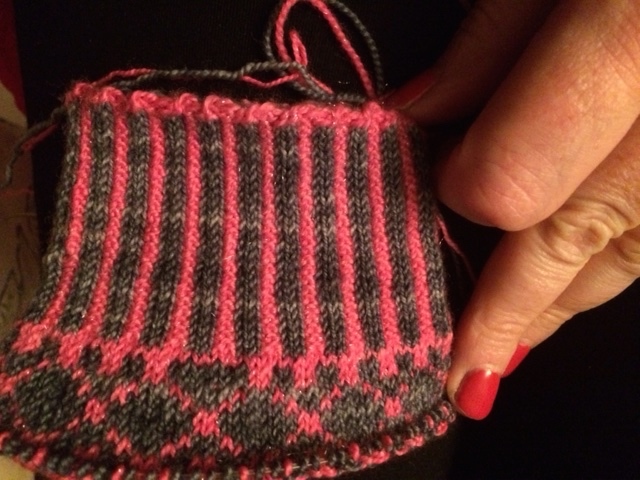 Maybe the impression will be different once I have knit it up into socks. 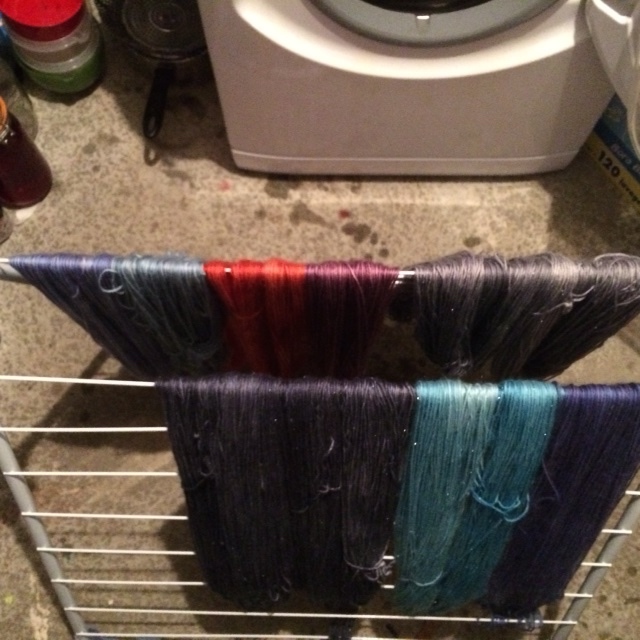 As always, Jalaa includes ideas for patterns for her yarn and usually those are simple patterns as plain patterns are best for showing off this magical gradient dyeing. 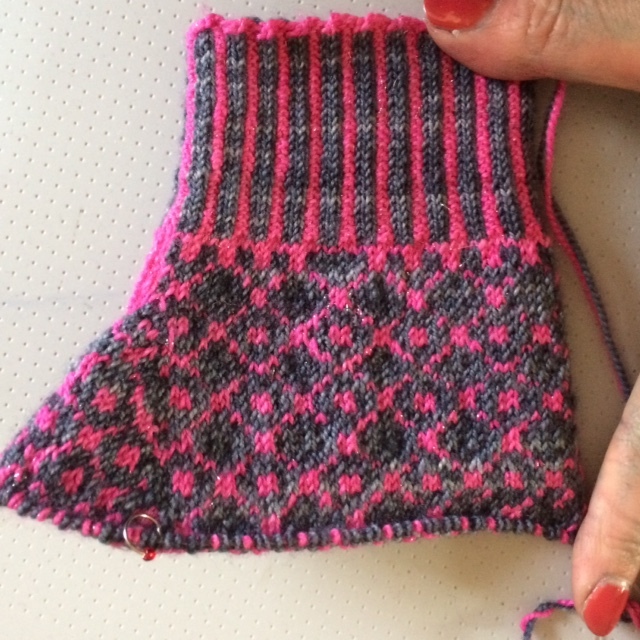 I haven’t chosen my pattern yet but I may just do a simple knit stitch with an afterthought heel. That will make for a therapeutic knit which is what I need at the moment. Jalaa also includes a little accessory with her yarn. 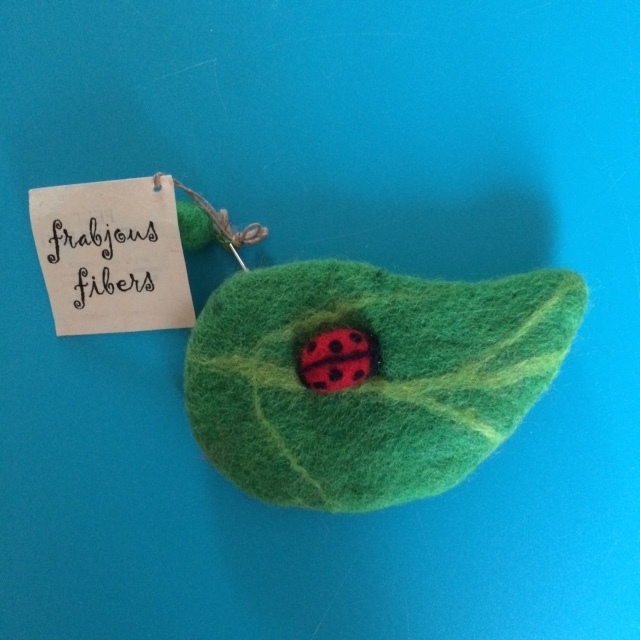 So far I have gotten stitch markers, a tape measure and now this gorgeous felt pouch This is handmade in Nepal by Frabjous Fibers and it is GORGEOUS. Hi there, over the last few days I have not been able to work as I’m too worried about my mom and her health. Some days I’m unable to do anything but just feel sorry for everything and I spend as much time as I can knitting away in front of Netflix series and movies. Other days I remember that she would not want me to just let everything go and that she is my business’s nr 1 fan and as such I owe it to her to take action whenever I have the time. 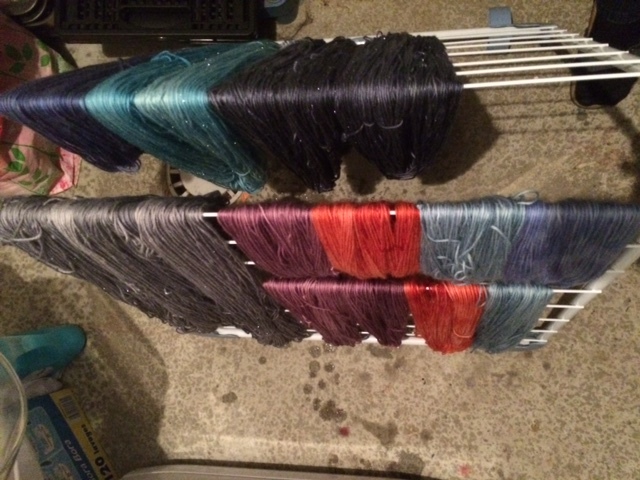 And that motivates me to dive into dyeing for example. 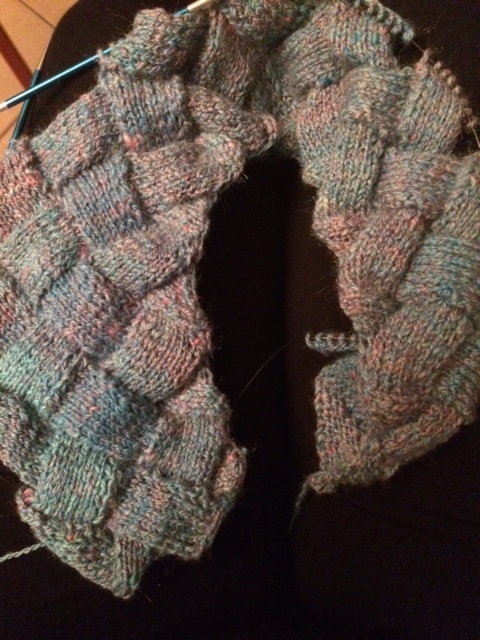 This is an entrelac project I’m knitting without a pattern, this is supposed to be like a large scarf or stole. I’m using my own handspun yarn and of course this is meant for my mother! Something to keep her warm. It’s been quite a while since I last did entrelac so I keep my book close by as I need a reminder every time I reach the end of a row/round how to go about making that last square and how to begin the first of the next row/round. I’m finding it quite fun and am practicing my backwards knitting as I hate to constantly turn the work to purl just a few stitches. Also this makes the project go so much faster. 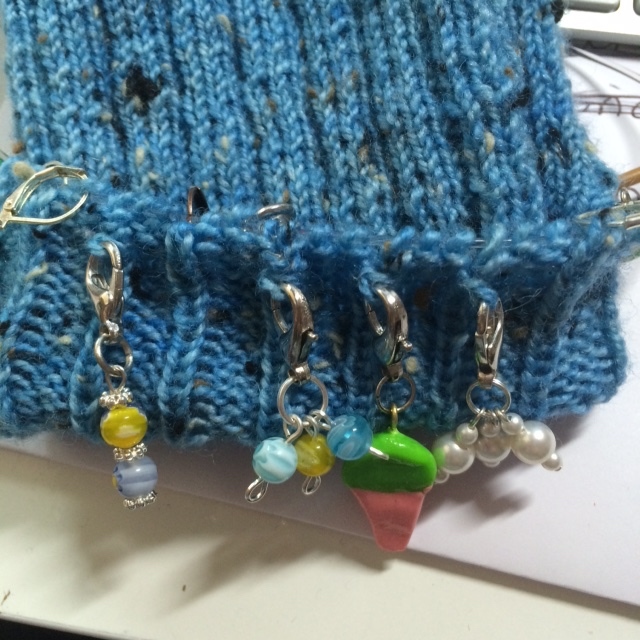 And I finally got some work done on my Sindri mittens by Shannon Okey – from her Aurora Borealis mittens book. The first picture is the front and the second is the back of the mitten. 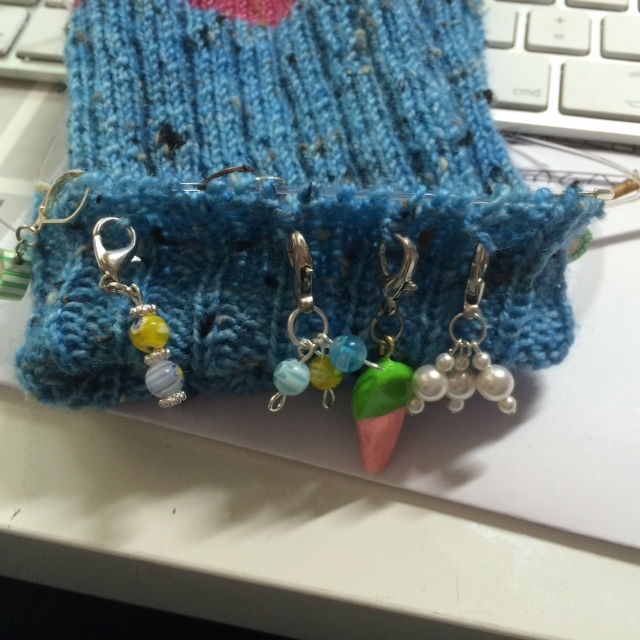 I’m not far gone but colourwork does take more time so thats ok. I’m loving my colour combination so that’s cool. 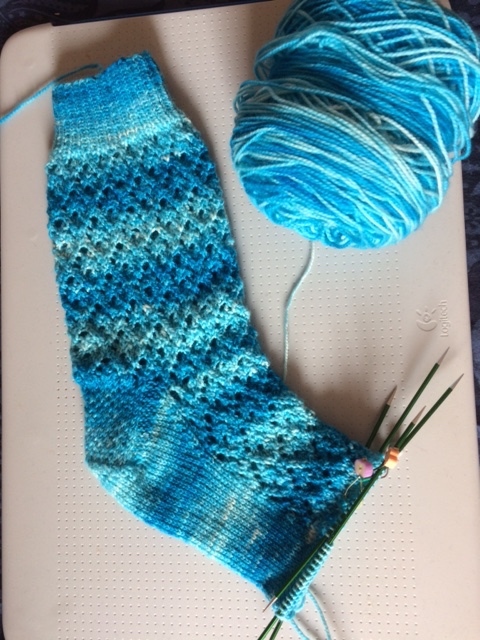 I also continued on a sock I began last week. 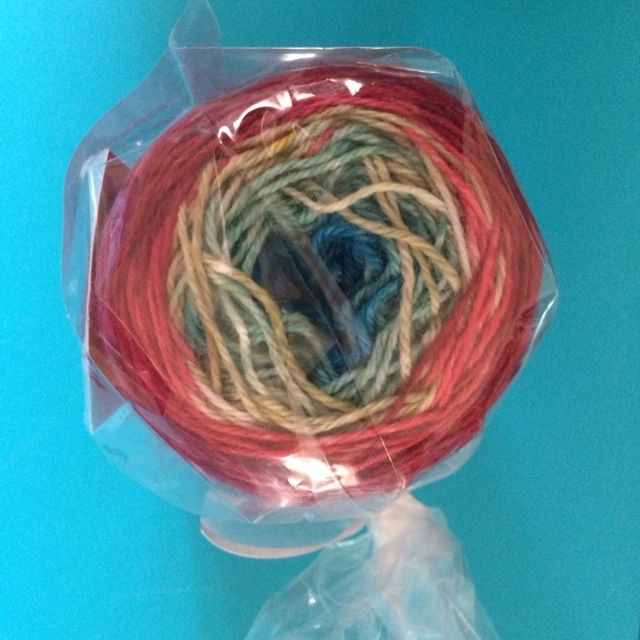 The yarn is of course my own hand dyed yarn. On the second picture you see the pattern better. 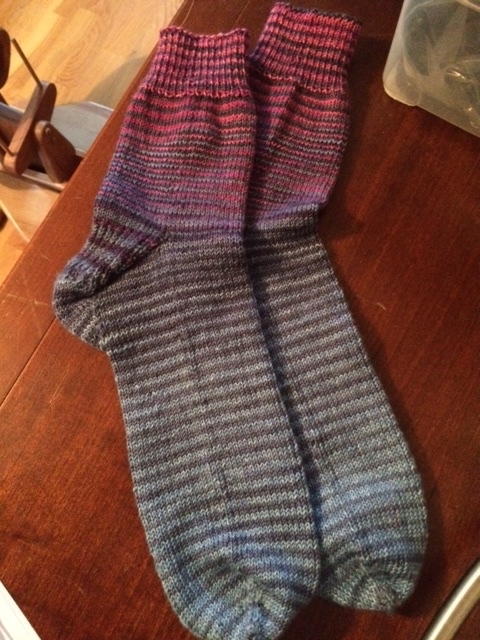 This is a pattern/sock that is part of my KAL knit from stash through the Addicted to Sock Knitting group on FB. So you see I have quite a few things going at the moment. That’s all for today, it’s time for me to run off to my yoga class for some quality time. Hi there, I wanted to show you something. 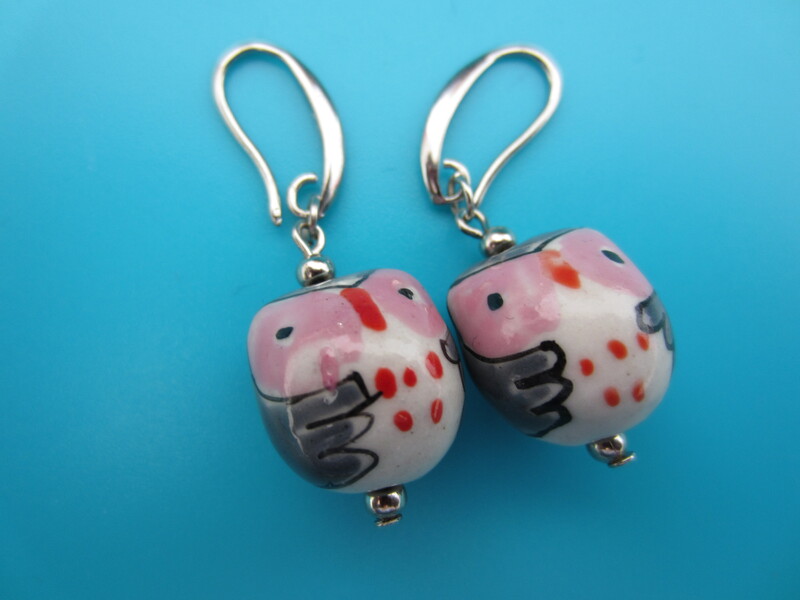 I also have another pair to show you. If you read my last post you will know that my mother just had a big heart attack and is very sick. I decided that we would prepare an “I love you” package for her. 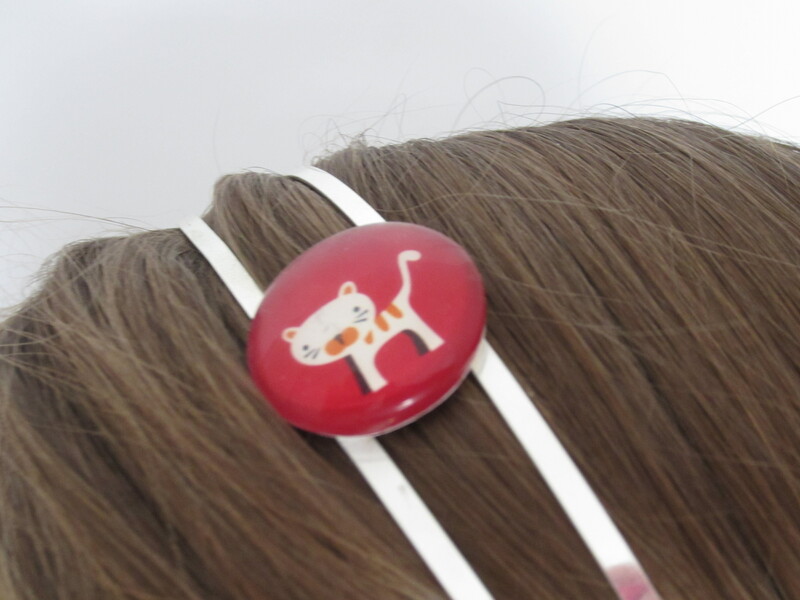 My children are going to draw her pictures and I’m going to give her a pair of hand knitted socks and some sweets – she has a sweet tooth and if she is allowed to eat chocolate and so I’m going to buy something very nice and include that with the package. I’m also going to knit her a stole or large scarf to put around her shoulders for when she is sitting up in bed for example. I haven’t decided on the model/pattern for that but I know I’m going to use one of my handspun yarns for that project. 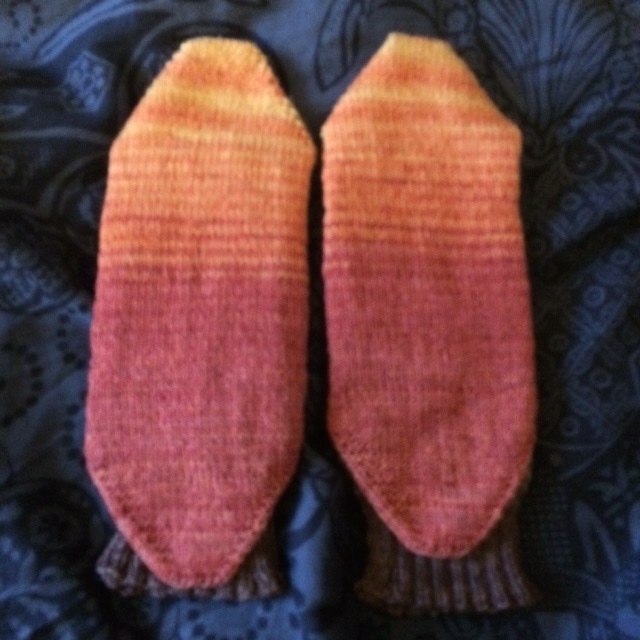 I thought I had actually finished this pair of socks so I went to photograph them to show you and that’s when I discovered that having been so distraught lately I had messed up. I only did the patterning on 1 side of the leg instead of on both sides! so I had to rip bag the entire leg of the second sock and so thats what I’m trying to finish as quickly as I can now so I can send that to my mom. Can you see how amazing the dying is? The socks are almost a perfect match! Jalaa Spiro of Knit Circus is a true magician dyer. Hi there, I don’t know if I should actually write this post or not. I’ve been thinking about it since yesterday and finally I decided to go ahead anyway. After all, writing makes me feel better and it helps me to get things into perspective and maybe even see things more clearly, with a little less emotion. I also trust you to just stop reading and turn to a different webpage if you do not like what you read and would rather not read something this personal. I hope you forgive me and that you will still come back to my blog, I promise I will not make this into a personal diary, I will keep this as a knitting and fibre related blog, except mostly for today. So what gives? Well, about 36 hours ago, in the evening of March 18th my life was turned upside down by a horrible phone call. My mother just had a massive heart attack and she was in emergency surgery. I went into shock. How is this possible??? She’s only 63 years old, she does not smoke, drink, she is not diabetic or overweight. She has not had any signs, nothing. My world just crumbled to the ground. And what is even worse is that I’m so far away. She’s in Iceland and I’m in France – not far away on a daily basis but under these circumstances I might as well be on the other side of the globe! Unfortunately the surgery did not go as well as we could have hoped for and she is not doing very well. I’m told all the complications are “normal” and that she is in the very best of hands and that she will get better although she does have damage to her heart and lungs – just how much we will not know until later this week. I think that a mother is THE most important person in anyones life and we only have one so new such as this just makes you stop and think – that is once you have stopped crying. I admit that I cried for a number of hours but today I’m able to talk about this and not cry continuously. I would like to just hop on the next plain and be by her side ASAP but life is never that simple. I also have my own family of 3 children and a husband that works long hours and sometimes travels and this is just a time where he is away for a week. So I have to hold onto hope and trust in God and the doctors that she will be ok. I try to convince myself that it is ok if I don’t go just now, she is in the hospital and I cannot do much for her there. If I come once she is home I will be able to be with her all the time and help out at home. So that is what I’m going to do. So in a few days I’ll be going to Iceland and thus may not write regularly for a week or so. This also affects my planning for the next few weeks. I will not be dyeing more yarn for my shop but rather concentrate on selling the 450+ items already listed there and concentrate my dyeing on preparing for the I Knit Fandango show in London this May. So the shop may look a bit dull or stagnated for a while but I promise that is only temporary due to these special circumstances. 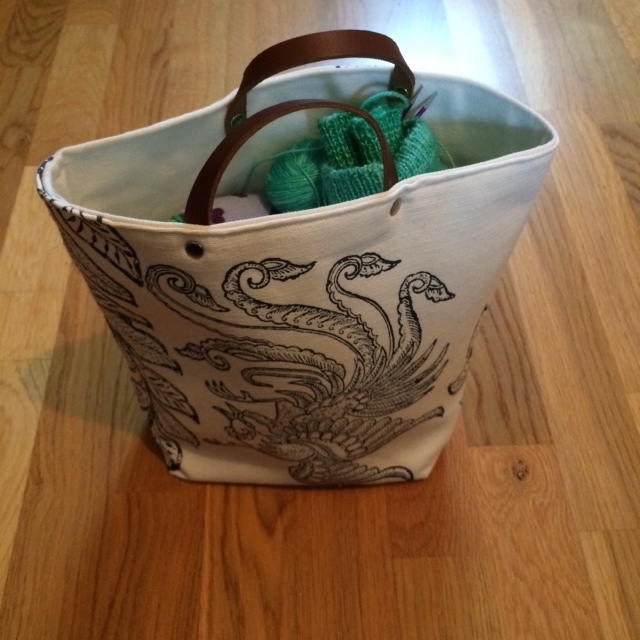 You know, back in 2011 when I launched my Knitting in France e-commerce adventure, not everyone believed in me. My mom on the other hand was all for me, she has always been my nr 1 fan and she is convinced that I can make it, that even though 4 years into my adventure I’m still not making a living from the shop, she still thinks my efforts are worth it. She understands the pleasure I get from doing something I love, she understands my desire to try my hardest to create a job for myself, to make a living doing something I really truely love. So I’m definitely NOT going to let her down. No I’m going to continue to make her proud of me and I will continue to put as much time and effort as I possibly can into my shop and one day I’ll be able to say to her: you were right! I CAN do this! So even though I’m infinitely sad at the moment and that I have to kick myself to get anything done as all I feel like doing is curl up in bed and cry, I’m going to continue. I’m going to make a plan, a schedule to keep focus and to not get overwhelmed. Set goals for each day, however small, and that way I KNOW that I will be able to continue. My mom would hate to see me close the shop or lose hope “just” because she is not well. So I’m not going to worry her, I’m going to continue and show her what I’m capable of with her help and belief in me. As I’m writing this, tears roll down my cheeks so it’s probably time to say goodbye for now. If you are still reading me then thank you for taking the time and for reading my words. I’ll be back with a more positive post I promise. Until then, take care of yourself and your family, nothing else matters. This does make one smile (me at least) but its also a life saver so I made it through my two afterthought heels in no time and with no stress. So if you run into the same or similar problem when picking up stitches, using locking markers will save your life!